All roles are open and unpaid. Bring sheet music; an accompanist will be provided. No a capella or recorded music. Rehearsals are Monday-Thursday evenings and Sunday afternoons. Please bring a list of conflicts to the audition along with a current headshot and resume (if you have one). 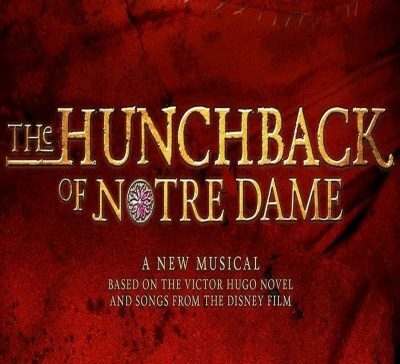 From the Academy Award-winning team of Alan Menken (Beauty and the Beast) and Stephen Schwartz (Wicked, Pippin) comes a lushly-scored retelling of Victor Hugo’s epic story of love, acceptance and what it means to be a hero. As the bells of Notre Dame sound through the famed cathedral in fifteenth-century Paris, Quasimodo, the deformed bell-ringer, longs to be part of the world below. Held captive by his devious caretaker and uncle, the archdeacon Dom Claude Frollo, he escapes for the day and joins the boisterous crowd, only to be treated cruelly by all but the beautiful gypsy, Esmeralda. Quasimodo isn’t the only one captivated by her free spirit, though – the handsome Captain Phoebus and Frollo are equally enthralled. As the three vie for her attention, Frollo embarks on a mission to destroy the gypsies – and it’s up to Quasimodo to save them all. With a sweeping score and powerful story, audiences will be swept away by the magic of this truly unforgettable musical that proves that being different is what unites us. Quasimodo (ages 20-30): The big-hearted, but deformed bell-ringer of Notre Dame and Claude Frollo’s charge. Lonely and staunchly obedient to Frollo, he possesses a vivid imagination that brings to life the bells and gargoyles of the cathedral. Despite his shyness and uncertainty, he quickly befriends Esmeralda. Big-hearted, and brave when need be. Esmeralda (ages 20-30): A beautiful and free-spirited gypsy who possesses the strong sense of justice and morality that Frollo lacks. Compassionate, she frees Quasimodo from the frenzied mob at the Feast of Fools and, against her better judgment, falls for the cocky Phoebus. Dom Claude Frollo (ages 40-50): Archdeacon of Notre Dame Cathedral and the most powerful cleric in Paris, he is the reluctant caretaker of Quasimodo. He will do whatever it takes to rid the city of the gypsy “vermin,” even as he lusts after Esmeralda. Calculating, manipulative, and obsessive. Capt. Phoebus de Martin (ages 25-35): Returning to Paris after serving in the war, Phoebus takes up his new position as Captain of the Cathedral Guard. Overconfident yet charming, this handsome, strong soldier makes the ladies swoon, yet his moral compass is also strong, and he openly defies the corrupted Frollo. Clopin Trouillefou (ages 30-40): The clever and charismatic King of the Gypsies. An air of mystery surrounds Clopin, who often leaves the scene in a puff of smoke. As the master of ceremonies for the Feast of Fools, he is witty and playful, but he boasts a darker, serious nature when not performing for the crowd. Jehan Frollo (ages 20-30): Claude’s reckless younger brother. With the gypsy Florika, he fathers Quasimodo, who he leaves in his brother’s care. Wild, passionate, and strong-willed. Ensemble role. Florika (ages 20-30): A Gypsy and Quasimodo’s mother. Wild and carefree. Ensemble role. Saint Aphrodisius (ages 25-50): A stained-glass image that comes to life. Ensemble role. Choir (all vocal ranges and ages): Non-dancing. Must have excellent voices and the ability to harmonize well as they carry the big sound.